Hi! 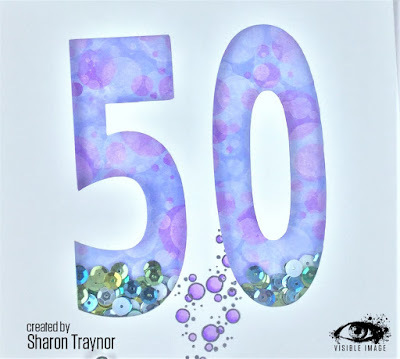 I’m sharing a card today that I made in honour of the 50th birthday of Mark Alexander, our Creative Director at Visible Image. My card is a CAS little shaker and it can be adapted for so many ‘big’ or even little birthdays. I’ve been dying to try out the solid circle stamps from the amazing set called The Ripple effect as I thought they are perfect for the bokeh technique. They worked like a treat and the resulting panel has been used as the backdrop for the numbers. I made this card by cutting the numbers into an A5 (UK size) panel on my ScanNcut. I backed the numbers with acetate and glued the middle of the zero onto the acetate too. The bokeh panel was created by cutting a piece of card large enough to cover the cut-out numbers with room for 3d foam tape around the edge. It was coloured all over with shaded lilac distress stain, then repeatedly and randomly stamped with the solid circles in 1) shaded lilac distress ink, 2) shaded lilac distress oxide 3) wilted violet distress oxide 4) picket fence distress ink and finally 5) versacolor opaque white inks. 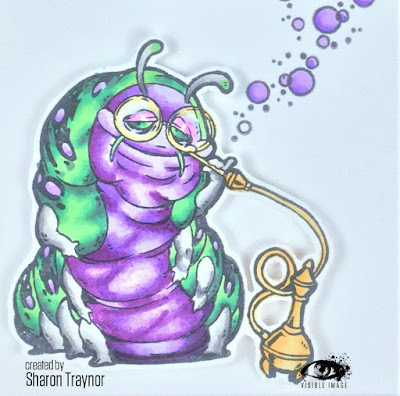 The caterpillar image was coloured with promarkers in greens, purples and golds and then it was fussy cut and just laid onto the front panel so that the tiny bubbles from the Dare To Swim set could be positioned and stamped. The bubbles were coloured in with promarkers to match the bokeh background. Shaker tape was added to the outside edge of the bokeh panel, and then some green, gold and white sequins were laid into the centre. The acetate was treated with an anti-static pad to stop the sequins from sticking to it, and then the front panel was stuck to the bokeh panel. The whole of the front was adhered to a card blank and the caterpillar image was added with more 3d foam pads. Distress stain, shaded lilac, Distress Ink (shaded lilac, picket fence) Distress Oxide (shaded lilac, wilted violet). Versacolor opaque white, Memento tuxedo black ink, promarkers, acetate, shaker tape, foam pads, white card. We will be back later today with more superb inspiration! This entry was posted in Alice in Wonderland, Birthday cards, Cards for men. Bookmark the permalink.